On Sunday, May 26, 2013, Holy Trinity Seminary in Jordanville, NY celebrated its 65th annual commencement. Candidates who had successfully completed all requirements were awarded Diplomas of the Bachelor of Theology degree and the right to wear the seminary graduate’s badge. These together signify the culmination of years of successful study, examinations, participation in Holy Trinity Monastery’s divine services, and labor at monastery obediences. Holy Trinity Seminary’s Bachelor of Theology degree is accredited by the Board of Regents of the New York State Education Department, which gives students the opportunity to further their post-graduate educations. The graduates prepared all week with comprehensive exams, as well as preparing a farewell luncheon as a final service to the brethren of the monastery and their fellow seminarians. 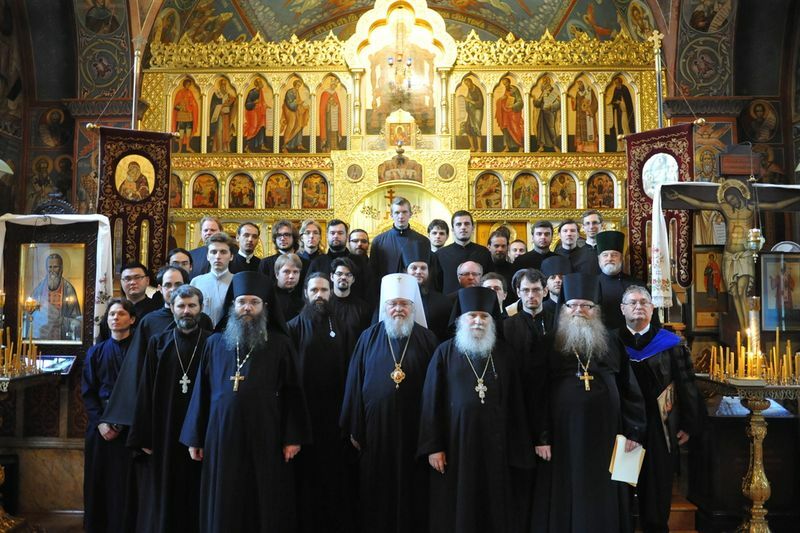 The Commencement was preceded by the All-Night Vigil and Divine Liturgy, which were led by the First Hierarch of the Church Abroad, His Eminence Hilarion, Metropolitan of Eastern America & New York. During the Liturgy, graduate Peter Markevich was ordained to the diaconate. After lunch on Sunday, all seminarians, including graduates, gathered outside the monastery refectoryfor a procession to Holy Trinity Cathedral, singing “Christ is Risen” as they processed. A thanksgiving moleben was served, followed by a group picture, and the procession to the Seminary Hall. The graduation ceremony opened with the prayer “Christ is Risen,” followed by local arrangements of “The Star-Spangled Banner” and “God Save the Tsar,” the national anthem of the Russian Empire, sung by members of the seminary/monastery choir. Archimandrite Luke (Murianka), rector of Holy Trinity Seminary, officially declared the ceremony open. He gave some encouraging words to the graduates, followed by an address by Metropolitan Hilarion. After the First Hierarch came the keynote speaker, Sergey Chapnin, senior editor of the official Moscow Patriarchate magazine. Mr. Chapnin, an eminent journalist of Church matters, had much to say about contemporary religious thought in Russia and the current state of post-communist Russia concerning religious matters. He addressed challenges facing the Russian Orthodox Church today. At the conclusion of Mr. Chapnin’s address, Bachelor of Theology degrees were awarded to the graduates. 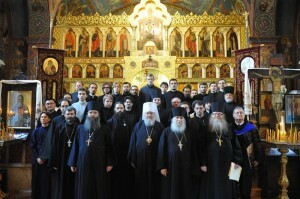 Before the awards for excellent academic performance were presented to the students, Metropolitan Hilarion awarded Protodeacon Victor Lochmatow the Synodal Order of the Sign, Third Class, in recognition of forty years of teaching and service to Holy Trinity Seminary, for which he received a standing ovation from all students, faculty, and guests. Valedictory speeches were given in Russian and English by Deacon Peter Markevich and Hierodeacon Seraphim (Nikoloski), respectively. The Commencement ceremony concluded with prayer, followed by a festal luncheon for all in attendance. We congratulate the class of 2013 and wish them many years of fruitful service to the Holy Orthodox Church!